Here is a question from Duncan. He says he’s got twin girls who are seven weeks old, and one of the girls is a good eater but the other one usually takes longer and is a little more fussy. How do you coordinate your attention when feeding them both? Also how do you go about burping them mid-feeding when you are feeding them both? The core here is that you have to take turns, as there isn’t really another way when they both require special attention. 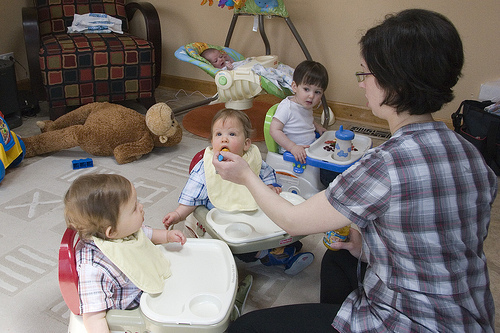 Most of the time when the twins are playing nice you can feed them both at the same time. However, when they’re not playing nice and one needs more attention than the other, you’re going to have to switch your attention and focus between each of them back and forth. One thing that we liked to do when we were bottle feeding our girls is that one of us, my wife or myself, would sit on the floor between two bouncy seats and pop a bottle in each baby’s mouth to feed them. This worked great when they were happy and drinking, but like you mentioned in your question Duncan, sometimes one of them gets fussy, one needs a burp, and you just have to stop feeding them and take care of that one infant at that time. Keep in mind of course they’re going to cry when they’re not getting food and attention, and that’s natural, and it’s okay, and it’s not the end of the world. You don’t need to get stressed, you don’t need to freak out, and you don’t need to rush more than is needful in this situation. Hang in there and you can switch back and forth as fast as you can between the two babies. This of course, even from a very early age, is going to teach your twins that they’re not the only one who needs attention and that they will have to share lots of things, including your attention. Remember that it’s always okay — whether while feeding or in other cases like changing diapers, getting dressed, helping potty train, you name it — it’s always okay to take one twin at a time. This topic was originally addressed on the Dad’s Guide to Twins Podcast Episode 70: Dual Feedings, Gender Preparations, Guy Friendly Diaper Bags. Picture by surlygirl. Our twins were in the NICU for several weeks before coming home, so they were on a schedule where one was fed 30 minutes before the other. That worked well for a while, but there were definitely times when they were both screaming and we had to feed both together. Some kind of seat or boppy for each of them was the key for that. They are 15 months old now, eating at the same time, and my son gets very impatient when my daughter takes her time. It gets easier to manage as they get bigger though. For example, at breakfast I can toss him a few pieces of french toast to nibble on while I deal with her pickiness. @Aimee – they do get easier as they get bigger. I’m happy to hear you’ve got a system that works! I have a solution! I had twin boys on July 15th, at my shower I received a Twin Z pillow. Unknowing of how crucial this would become in my life I attempted to breastfeed them both in the hospital and it was difficult and time consuming. So rolling the dice I sent my husband home to get this pillow (a large boppy that holds both twins allowing you to feed them both, be able to continue feeding one when having to burb one of them, and console them without disturbing the feeding of the other). Plus they can sit in them next to each other when not in use. Check it out, I recommend to any mom of twins! Good luck! @Darla – this is a great pillow and perfect for helping to feed both babies. Thanks for sharing what worked for you!